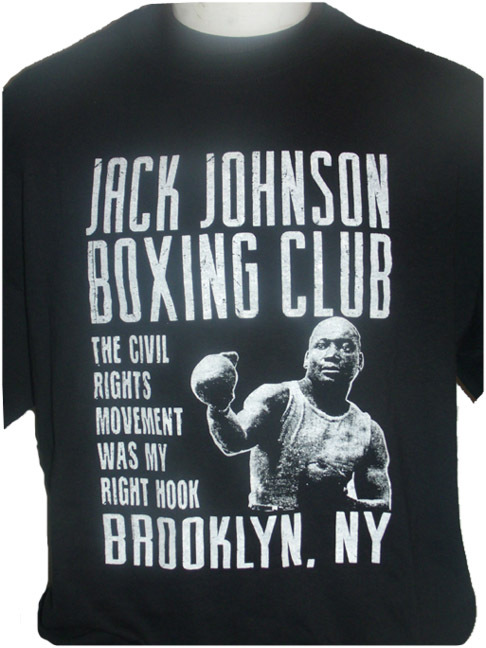 Jack Johnson Boxing Club Tee - 100% heavy duty cotton Gildan brand with silkscreen design. A real collectible that demonstrates a key figure in both American sports and the civil rights movement. John Arthur "Jack" Johnson (March 31, 1878 – June 10, 1946), nicknamed the Galveston Giant was an American boxer, who—at the height of the Jim Crow era—became the first African American world heavyweight boxing champion (1908–1915). In his own way, Jack Johnson defied stereotypes and limitations set by narrow minded thinking at the time in the early 20th century. Although Jack grew up in the South, he said that segregation was not an issue in the somewhat secluded city of Galveston, as everyone living in Galveston’s 12th Ward everyone was poor and went through the same struggles. Johnson remembers growing up with a "gang" of white boys, in which he never felt victimized or secluded. Remembering his childhood Johnson said, "As I grew up, the white boys were my friends and my pals. I ate with them, played with them and slept at their homes. Their mothers gave me cookies, and I ate at their tables. No one ever taught me that white men were superior to me." Jack would carry this mentality to his boxing career, as he would not be intimidated to fight any man, no matter their race.